“Pundalika Varadaa”……… Panduranga Hari Vitthala! Pilgrimage to Pandharpur near Sholapur in Maharashtra and having darshan of Lord Vittal is incomplete without mentioning the great devotee Pundalikan. Pundalaikan who hailed from southern part of India undertook a pilgrimage to kasi along with his parents and family . As his old parents couldn’t withstand the long journey they camped on the banks of Bhima river in the present Pandharpur. As there was no improvement in their fitness and due to their old age , they decided to stay there forever serving LORD and his devotees . Pundalikan was a caring and obedient son . Always in the service of his parents chanting the holy name he continued to start a fresh life being at this new place. The Divine Name of ‘ Jai Jai Ramakrishna Hari Jai Jai Vasudeva Hari’ ever reverberating in this holy town made him swoon into transcendental bliss . Pundalikan was so concerned that he changed the course of the river so that it would pass by his hut to enable his parents for taking their daily bath . Even today we can see the shape of this river looks like a crescent of moon and hence the river came to be known as “Chandrabhaga” river. All compassionate Lord Krishna in Dwaraka, wanted the world to know about this great devotee Pundalikan who was serving his parents with utmost sincerity . 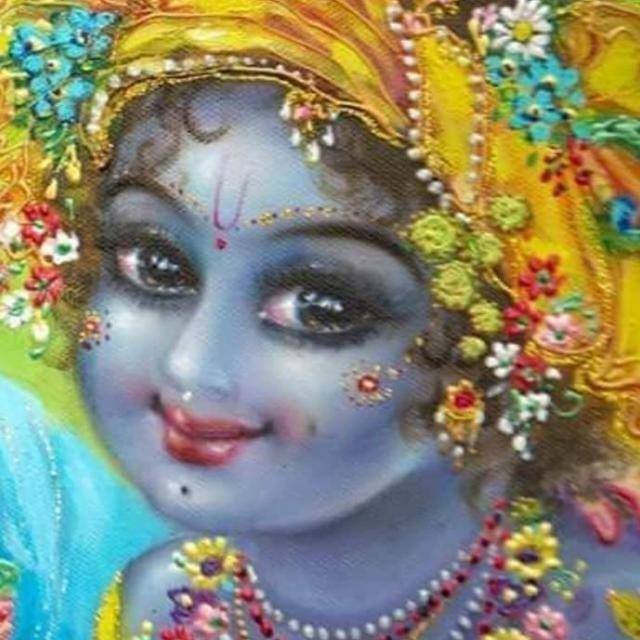 The cheerful obedience mixed with devotion attracted Lord personally to visit his hut to bless him. It was a direct meeting of the great Lord with his favorite devotee . Lord arrived near his hut silently and was immersed in listening to his devotees Nama sankirtana. Lord walked inside his hut like a normal man and looking at his devotee called him. Pundalikan was engrossed in the Holy name and was serving his old parents by comforting their legs . The voice was melodious …… unheard …. Pundalik was in trance and that bliss he was already enjoying the holy name in his transcendental mood and hence he did not want to come out of that mood ..
and he did not want to disturb his old parents sleep as they too were engrossed in the Holy name .. He attempted to whisper slowly his helplessness ,that he couldn’t come and receive the honorable guest due to his position . He requested him to please wait . He presumed that once his parents were fast asleep he could take leave from them and attend the respected guest . He innocently requested the revered guest to rest . Lord replied , I find only bricks around . Any way as desired by his devotee he just stood on a small brick which was lying nearby. The demigod Indra to atone for his brahmahathi dosham immediately took the form of brick awaiting Lord’s arrival so that the Lord would place HIS lotus feet. The divine incident was happening at the great devotees hut. Once he observed that his parents were fast asleep , he comforted them and looked around . Pundalikan had a glance of the wonderful darshan . Lord Krishna as Vitthala, standing on a brick, hands on hips, with a smile on his lips. He scanned the lovely form further . His eyes were starving for that darshan .Torrent of tears flowed ..Speechless . His soul now rejoiced in pure love ..
His breath that was synchronized with the holy name could swim deep in that ocean of sheer bliss .. Nothing more ..Let this remain with me . LORD ! Please forgive me for asking you to stand on the brick ..
Lord Panduranga, Lord Vittala the enchanter of the Universe, wearing ‘Makara Kundala’ (fish shaped ear stud) in his ears, ……. Peethambara (clad in yellow silk), wearing exquisite royal ornaments, a bewitching smile playing on His lips and having the insignia of Goddess Lakshmi on His chest, two palms on His hips was looking at Pundalikan ..
Pundalik was overwhelmed and touched . He submitted to LORD for HIM to stay there forever. Lord with a enchanting smile replied ..
Rukmini ,SAtyabhama arrived later , assumed the same posture of Lord and blessed Pundalikan. AT the behest of Pundalikan, Lord resides here and gives darshan to millions of devotees . 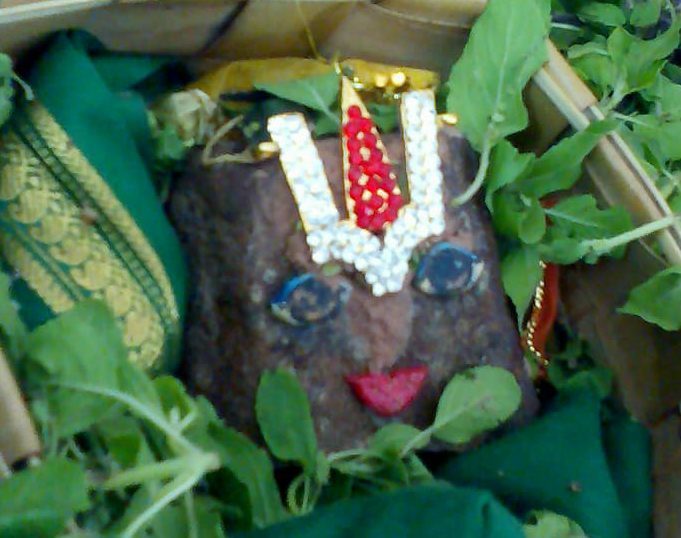 As Lord stands on Vittu(brick) , HE is glorified as as Vittalan. The place where the Lord stands is the present temple. The Saints like Namdeo, Dnyaneshwar to Tukaram wove their life around Vitthala and saw in Vitthala their brother, father, friend and a compassionate Lord who could bless them with ultimate salvation. Pundalikan and his parents attained Lord’s feet after the divine darshan . The Pundalika Temple is about half a km from the Vitthal Temple. This temple marks the spot where Pundalika, the Lord’s devotee, spent the last years of his life and also is the place of his Samadhi. It is on the riverbank of Chandrabhaga. Next post“Thiruvedupari utsavam” 20/03/19… The Divine loot by Azhwar at Seerkazhee in Tamil Nadu..
Swamin, Adiyen is literally blessed listening to such stories about Lord Vishnu in various forms. Many many thanks for you for recalling their glories before our eyes. Thanks again to you Swamin.